I was not able to choose one or two verses out of this Psalm, so I decided to post all of it. David knew what it was to cry out to God in prayer and for God to answer his prayers. We, as a church, are studying prayer. There is no greater study right now for us than this for it is through prayer that God hears our hearts’ desires and gives His blessing, His favor, His guidance and His power. Join in with David’s prayer today. Reread this Psalm and long for the conclusions of verses 11-12 to be true in your life. Tonight we will gather at 7:00 for prayer. I long for the day when all of our church would gather together for prayer. God desires this and we should long for it. Change your plans this evening and join us at 7:00. If you cannot stay for the Bible study, that is fine. Join us for prayer. When God answers we will then rejoice together. Tomorrow morning we meet at church at 5:45 to leave at 6:00. I will not be posting devotionals the rest of the week. If you are still considering going with us we would be happy to have you. Meet us at the church and come along. Sunday is our dinner day after church. Be sure to bring enough food for your family and a few others. If the weather is nice we will eat outside. I will be speaking from Isaiah 42:5-9. God wants us to know that He is God. This is an important message for us, (all from His word are) as we are faced with calls to doubt God as creator and as sovereign over all. When we see God as God we are much more secure in life and in future planning. I will be out of phone contact until Sunday. If you have a need call Tom Hymers or Bob Johanson. You can leave a message for me at 715-759-5976. There will be men’s prayer breakfast Saturday morning at Denny’s at 7:30. After a very long travel day we are finally home. It all started at 5:30 am. We left for the border at 6 am and crossed with no hiccups. FINALLY we made it to McDonald’s for breakfast. From there went to the airport and waited for our 11 am flight. We left so early in order to miss the long lines at the border and miss our flight. Our plan arrived but they announced that it had mechanical errors. Three hours later we finally got on a flight to Houston Tx. Sadly we missed our connecting flight. The next flight they could put all of us on was at 7 pm. The teens did a great job of airport bumming for 5 hours. We ate, slept, played on our phones and explored the airport. Finally at 10 pm we landed in O’hare airport and very kindly the Pugas and Strejecks picked us up. Thanks so much for your prayers. 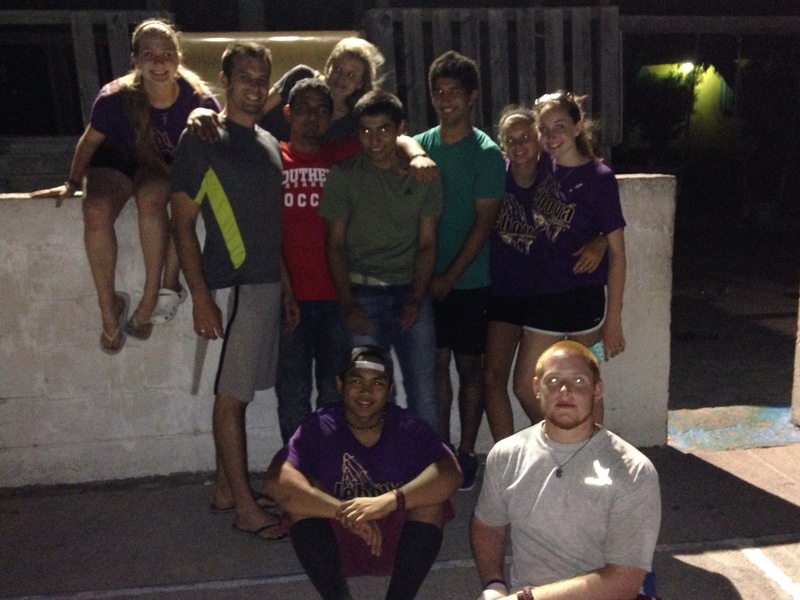 If you have been following our blog please stop and ask the teens about it and what God taught them this week. Today was the last day of work. 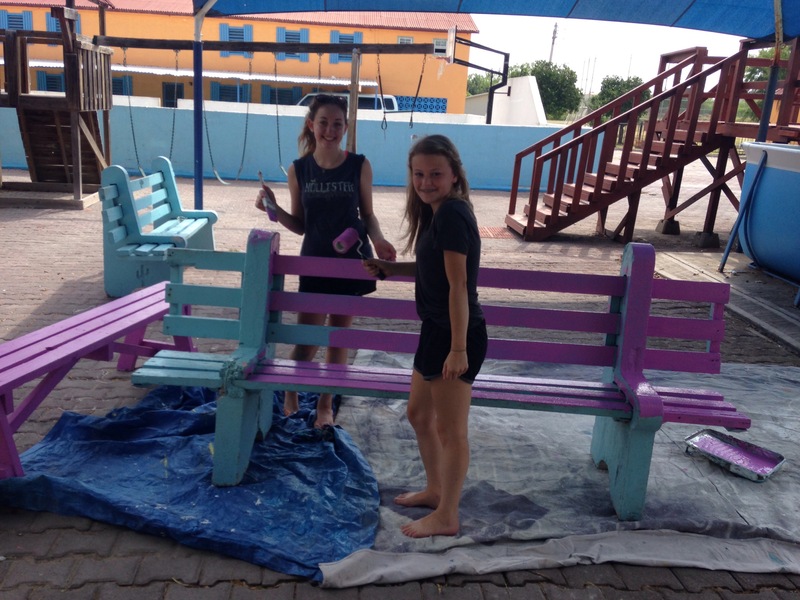 We spent the day painting benches for the school and orphanage. It was a fun and interesting paint job. 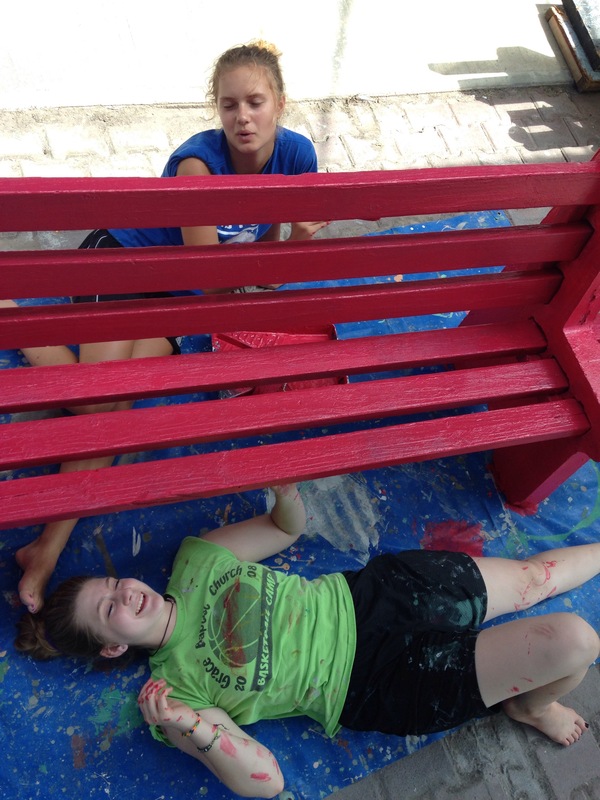 The teens enjoy it because they used fun and bright colors that you see in the pictures. Sadly to we also had to say our goodbyes. 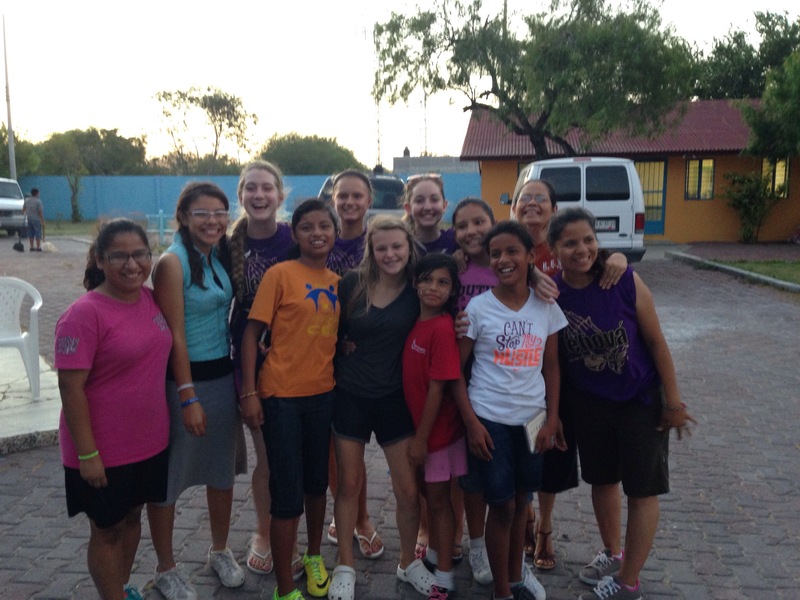 In a few days friendships begin to develop and respect and enjoyment for each other began. This is always the hardest part. The people here are so lovely and wonderful to be with. Mutual love was shown this week and both sides (American and Mexican) felt it. This made it difficult to say goodbye. But we all said our farewells with the hope that we will return next year to continue the friendships and union that we have with Christ at the center. We should be safe and sound in Naperville by 5:30-6 pm Thursday night unless traffic or weather gets in our way. Muchas gracias for your prayers for is this week. Dia de pintar – painting day! Today started with the aventerous Bible study of 1 John 3 which was a great study of sin habits and living as a member of God’s family. 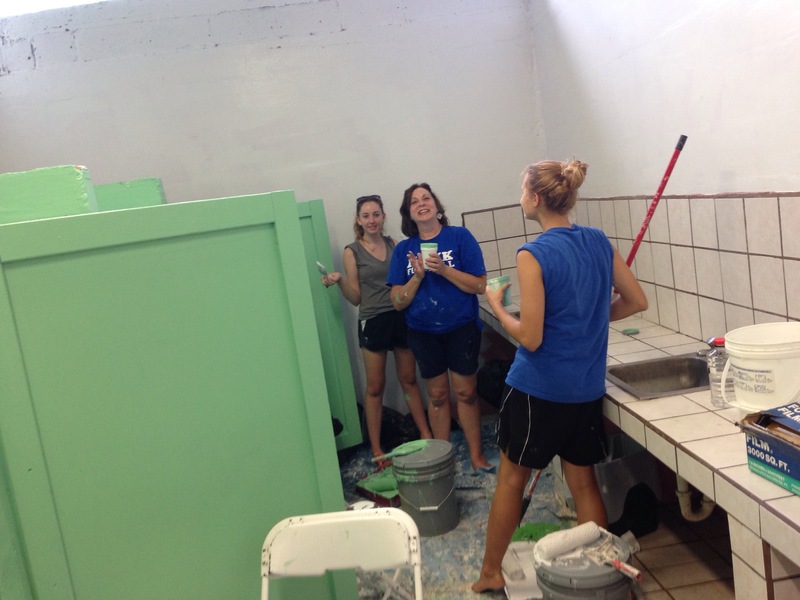 After breakfast we continues our painting work from yesterday (the boys bathroom) and began work on girls bathroom. 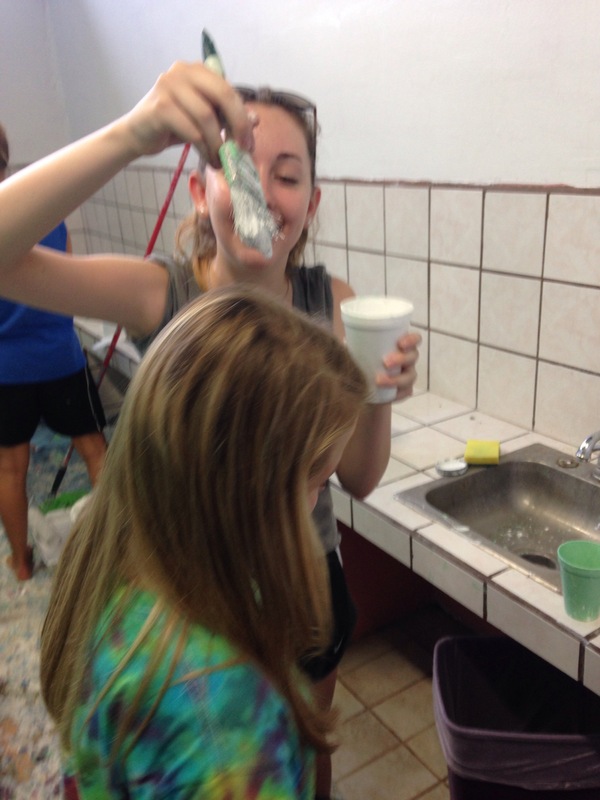 The girls worked on the girls bathroom while singing Disney songs. 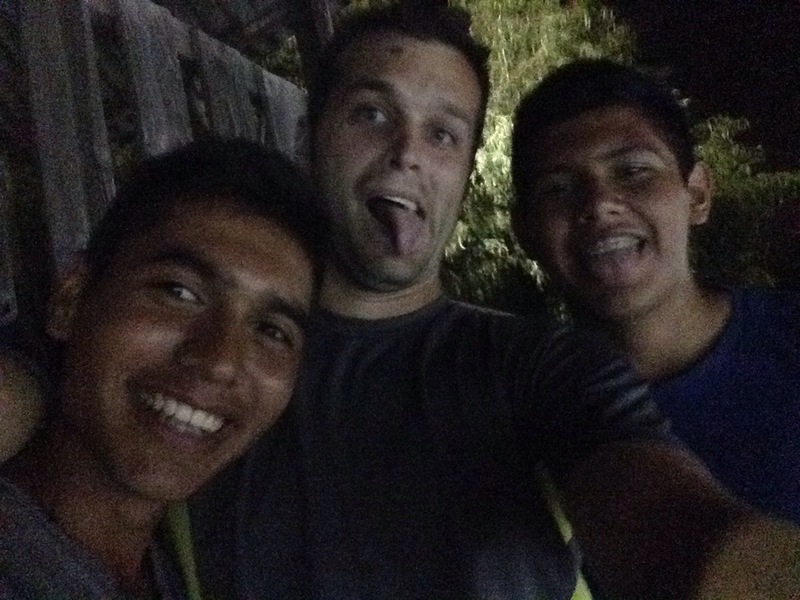 The guys worked on the boys bathroom while joining in on the Disney songs. We had fun working together today. 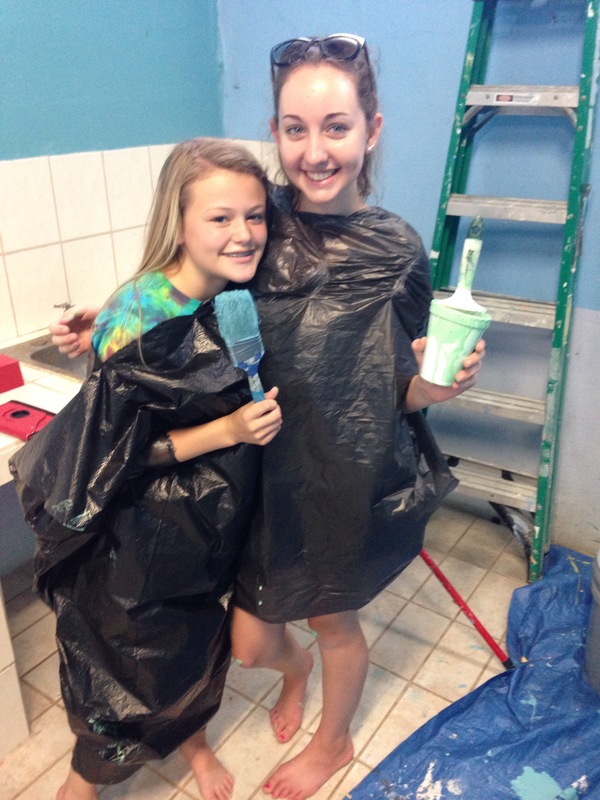 In the second half of the day we painted another classroom in the gymnasium. 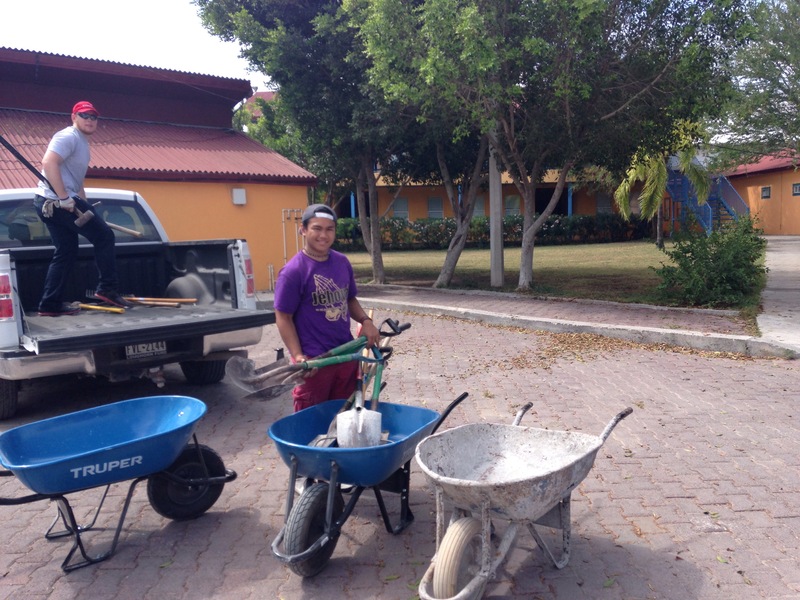 By the end of the day we finished both bathrooms and the classroom. Again today, each teen worked hard and did well today at working. 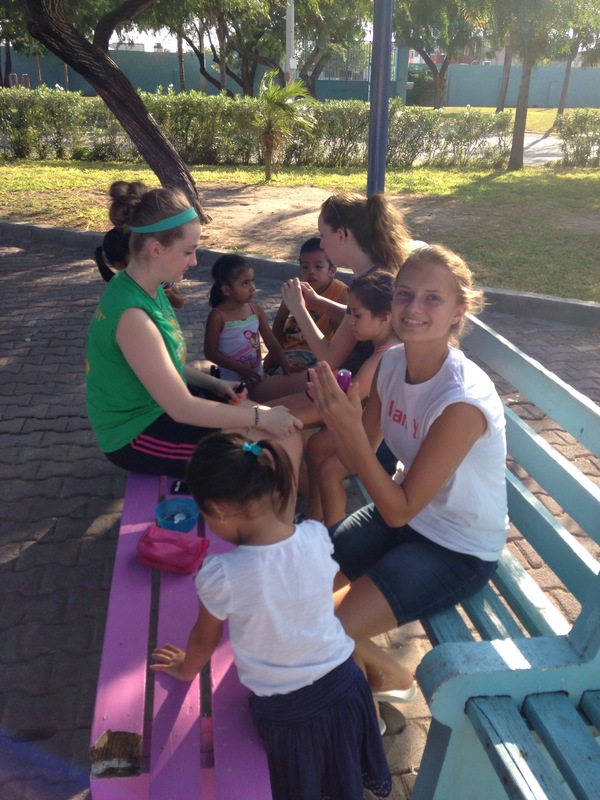 This evening some of the girls brought nail polish and took some time to paint any girls nails who wanted it done. 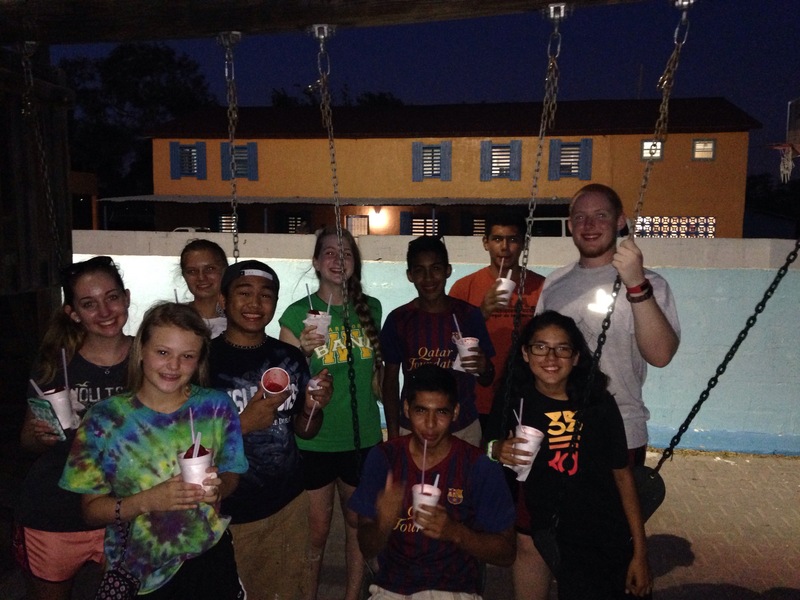 We also got some Mexican flavored ice. This proved to be a test of our love. The flavored ice was strawberry with lots of salt and hotsauce. We all tried our best to just eat it and not say anything but it was just gross to our American mouths. However the teens were polite and handled it well. Christ truly is in this place. Ray Hansen, the founder and director, shared his personal salvation testimony and how the Lord started this orphanage. It was such a blessing and a challenge to hear. From 0 to 60 kids the Lord has directed him every step of the way and Rey has had the faith the trust the Lord all the way through. We are so blessed to be in such a wonderful place where the hand of God is so visible. I hope more of our church people could come here one day.